Not the actual flu after all. Still, it knocked me back for most of a full week. Exactly when I’d planned to go offline and shut out the world in general, and wrestle the first dozen or so ragged chapters of Book 5 into something smooth and satisfying. I’ve been back at the office the last couple of days, but not actually useful in any real way. I’m still coughing, and running at less than full power. So, just reading, musing, and managing to play some guitar (but not singing, due to the coughing). I’m trying to learn Frank Christian’s “From My Hands.” I’m working from the live version on the Fast Folk Musical Magazine Volume 4, Number 4, which I love, rather than the title track from his album, a version that makes me wince. Even though the live track gets a bit over-accelerated, that’s the version that has all the crazy juice. The studio version was been sanitized, metronomicized, and light-jazzified away from any semblance of passion. 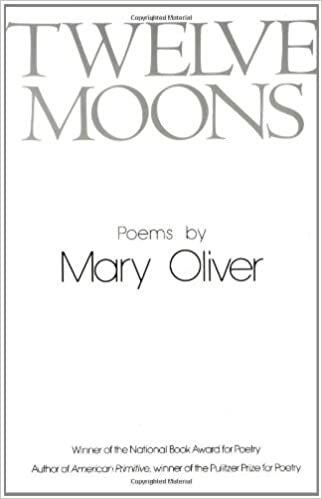 Meanwhile, out in the world, Mary Oliver has passed away, and everyone is talking about that. I so wish that I had found her work decades ago, instead of just recently. I can’t help but wonder how I would have taken her work when I was young, and how (or if) it would have influenced me and my own work? above the peaks of the house, and the crowns of the trees blue in the first light? free to everyone, and everything? thus coming, as I think, upon a right answer? and now I am sixty years old, and it is the same. And now, of course, the big storm is sweeping in upon us, to do to New England what it did to the other parts of the country that it hit. Four to eight inches of snow, they’re telling us. It’s just started falling here now. I should get home. 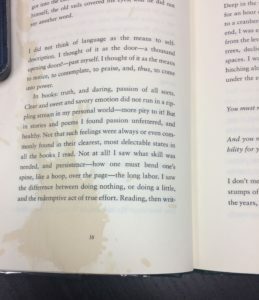 — a coffee-stained copy of Mary Oliver’s Upstream. Oh, and a cool tote from the Wallingford Library. 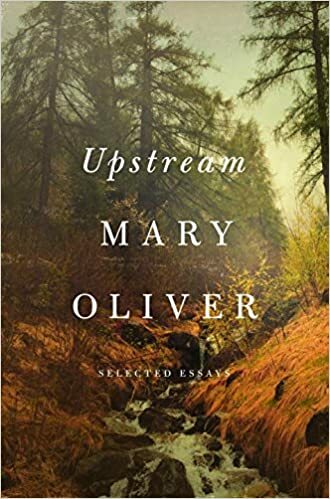 The library itself is now the proud possessor of a check from me for a brand-new copy of Mary Oliver’s Upstream. And a tote. Yep. There was a book, a cup of coffee, a slightly rickety table in the woods, and my elbow. All four met in unfortunate circumstance. I have to blame the elbow; there’s just no other explanation. I bought the tote because I felt that the library was not charging me enough for replacing the book. I wanted to give them more money, to assuage my vast guilt. On the upside, I now own the book. Plus: hey, tote! 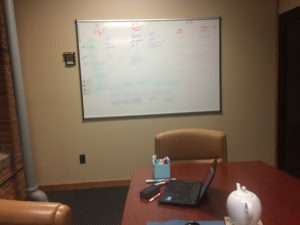 In my own office, I’ve tacked up huge sheets of dry-erase-style contact paper, to allow me to scrawl deep thoughts and work through twisty structural problems in multiple colors. At least, in theory that’s why it’s there. But alas, the contact paper does not work as well as an actual whiteboard. While it’s true that I can write on it, and erase it, I can only dry-erase in a 10-second window. After that, I have to spray on an ammonia-based solvent and use a sponge. This puts a crimp in one’s spontaneity. I work at night. There’s nobody here! As long as I erase before I leave, I’m cool. 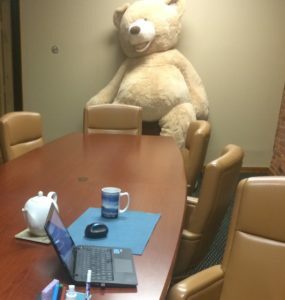 The billboard company never technically had exclusive use of the conference room. But it was next to their offices, and they were often gathered in it. So, I simply got it in my head that I don’t use the conference room. Plus, there’s a whole fishbowl aspect to it, with one glass wall, and its location among all the offices of the sales force. But now, they are gone. It’s just Dave and me. And that one programmer dude who’s never around. Plus — I work at night. Mostly. Strategically blurred to prevent spoilers. That was the night of the crazy rain and wind. 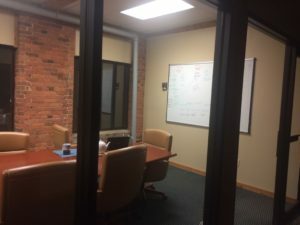 There’s something particularly lovely about drinking strong tea after midnight, rain and wind banging on the windows, dreaming up crazy solutions to near-intractable problems, while scrawling wildly on 6 by 4 whiteboard. Left over from one of their charity promotions… I do hope they find him a good home. Hope you enjoyed your Hallowe’en! I did — although I never did make it to the town’s justifiably famous Trail of Terror. I’ve always wanted to try it just once… too late now. Next up: More about the local library, about which not enough good things can be said.